I am thinking about going from Sketch to Figma.. Any inputs about that? I tried to contact them a few time and their answers are always vague. I've been using both for about a year now. The nice thing is I can switch pretty seamlessly because the UI is very similar and a lot of keyboard commands are the same. The big difference is in how I share. With Sketch, I use Craft Sync to push everything to InVision, then share a link. With Figma, it's just there. The client comes in and sees everything. Feels a little weird at first, but I really haven't had any issues, and what's more, both clients I'm using it with have picked it up and started using it themselves. Are you still using both? If yes, in which case do you use each of them? Yes, still using both. I have TONS of legacy files in Sketch for the client so I don't see switching that client over anytime soon. But all new client work is being done in Figma. I've never gone "back" to Sketch, but do occasionally use it because co workers still use it. I don't know how I'd survive without Figma's robust component/library system. I've amazed myself at how complex and creative I can get with "list" style content with a lot of child components. It feels as close to "atomic design" as it gets for design tools. Not having to deal with actual files is a lifesaver as well. There's a huge amount of process discussion that happens around files within company servers and it's a pain point my entire team feels. Being able to send someone a single unchanging URL for an entire project is awesome. Cross platform compatibility is awesome as well. I can give someone on a Windows machine a URL and they can use that in another meeting without asking me for a bunch of jpgs for their presentation. As you mentioned: the Figma team seems to be moving very quickly compared to other tools. They were one of the first to a holistic "team library", their latest API has had some very promising community projects and their upcoming Styles feature is looking good already. For me it feels like a natural evolution. A while back we all switched from Photoshop/Illustrator mockups to Sketch and I feel strongly that Figma is going to be the next mass transition. Each list item is a symbol. The original (top) does not wrap. I have them stacked vertically with Anima's AutoLayout plugin, but when I override the text on one list item to be so long that it wraps, the symbol does not increase its height to accomidate the wrapping text. There's no command to do it either, I have to manually drag the height down and eyeball it. Not yet. 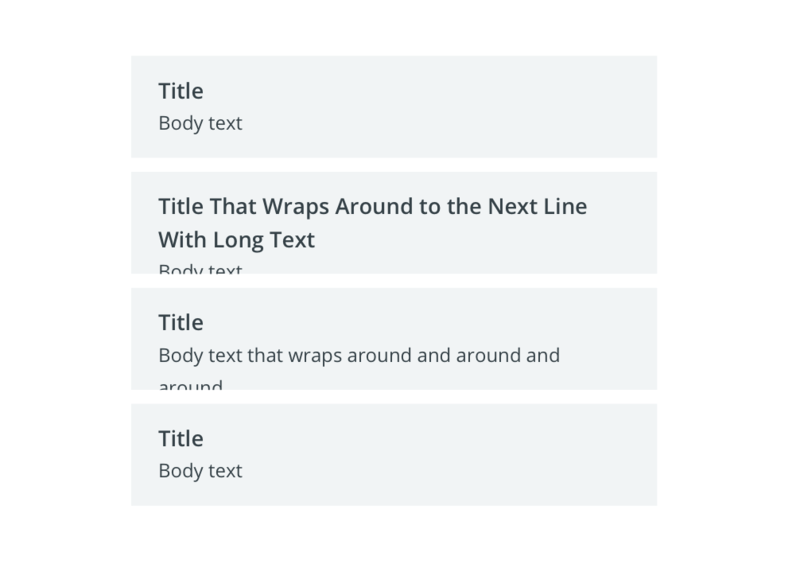 The best solution I've found for this is to make body text scalable with the parent component so that you can resize it if the text is too big. This is highly requested on spectrum though so I wouldn't be surprised if it's something they are working on. Thanks! And there's no equivalent of AutoLayout's stacks in Figma yet right? This spectrum thread seems to confirm. In Figma, I don’t know, butbin sketch, I use paddy to configure the spacing and auto size of a symbol. Why not paddy for the spacing as well? I love Auto Layout because for alignment this thing is a beast!!! I've fully switched to Figma for most of my work and am still using Sketch for my part-time inhouse contract. Figma is the superior tool for 90% of my day to day. It's faster (which feels insane to say about a browser tool), has a better/more intuitive UI, and the collaborative features are amazing and something that Sketch will likely never have. Plus it works on Windows (which I prefer). The 10% in which Sketch is superior to Figma is simply due to the plugin ecosystem. For example, my inhouse contract still requires a lot of PDFs (bleh I know, but CEO's gonna CEO) and while Sketch's PDF export is trash, there's a PDF plugin that works great. Figma on the other hand has a trash PDF export hack (SVG->Save as PDF) and there's just nothing you can do about it until they add the feature. If I was starting a design team or agency from scratch and was in charge of buying the tools today I'd go Figma hands down. The cons are minor enough and the pros are pretty massive. Hear you on PDF export. Have you tried https://spectrum.chat/?t=8c2ca793-3372-4e45-8f2d-91fe01ede73c ? I haven't explored it much yet but some users seem to like it. Built on Figma's API. I have not, but holy hell thanks for the heads up. Will definitely be trying it out. Very well said @Dylan.. I have tried it and it works great.!! Figma API is going to change the game v/s Sketch plugin ecosystem.. if only there were more people building on top of it. Love to see you here for on-ground conversations.. Keep it up..
Give XD shot. The June update now has overlay, fixed positioning of elements, and MUCH better image cropping. There is a limited free version available so you don't really lose anything to give a try. I switched to Figma in December and haven't looked back to Sketch at all. Managing a live-updated design system in the cloud makes 1000% more sense to me than a design team trying to simultaneously access .sketch files. Thank you! How is it dealing with big projects in terms of performance? There's an occasional lag maybe 2-3x a week, but still much better than dealing with enormous Sketch files. Prior to using Figma for the past year, I used sketch for 3 years. Don't plan on going back to Sketch any time soon. I noticed performance issues with big files in Sketch, Figma's desktop app is snappier imo. After reading this I'm not thinking of switching to Figma. I have used it briefly for some personal projects, but not really used it for any design systems but from what I read it's great. Anybody have any view into the long term pricing strategy at Figma? I'd like to switch over from Sketch but I don't want to bother getting up to speed in a new tool if they're just going to start charging a big monthly fee for solo users. I'm also considering switch but my concerns are that our office often experiences network issue that puts me offline or slow internet from time to time, and the ability to handle the simultaneous edits to the same file (or project or artwork, whatever it's called). We use Abstract but it doesn't seem to address all the problems. Does Figma address these situations somehow? I have worked extensively both in Figma and Sketch. Although I feel Figma is a much better way to work in a team, one thing that it lacks as of now is the availability of a read & write API. This would enable more people to write plugins and get work done faster. There are a few plugins in Sketch that I use and it allows me to speed up the process a lot. Seriously, a few I cannot live without. In case somebody wants a list, I am ready to help out. If sometime in the future they open this facility up to the community, they would be able to fill in most of the drawbacks that they have in their product right now. I've used Sketch steady for 2-3 years now. We switched to Figma 3-4 months ago and things have been nothing but amazing. I don't foresee going back to Sketch anytime soon. We are 2 designers at a startup. The ability for anyone on our team (designer or not) to see into any design file and prototype is awesome. Only pay for the contributors. The real-time ability to co-design in a single document is much more useful than I anticipated. Worked well in reviewing designs while I was remote working in Hawaii over a slack call. No need for Google Sync, or Dropbox, etc. Everything is all there. The benefit of being able to paste links to prototypes into Phabricator/Trello/Asana (whatever your task software) is awesome. We also prefix our design files with ticket numbers so everything is easy to find. The UI for managing your figma files is very efficient compared to Sketch, where you're looking through files on your mac. These are the main reasons. What you may miss out on are the plugins. I never used plugins that much, and frankly hated having to rely on Craft, InVision or Marvel for my prototypes. I know Sketch can now make prototypes but I switched before this was possible, so I can't speak for Sketch prototyping vs. Figma prototyping. I've been using figma for quite a while now. Being windows bound due to company policies I never used sketch extensively so my experience is just from figma itself. all in all the comments are pretty spot on, but beware of overrides and nesting for complex systems. Try them out well first if you have a need. We currently have our styleguide and nuclear components which we build into patterns (in another file) and templates. Inheritance is sometimes an issue to manage and we frequently have some issues when copying screens to new files where some components will copy fine while others will revert to frames. I'm not entirely sure if some are to having moved master components around and duplicating and reorganizing files (due to having upgraded from a single file project to a paid library). This is also the one part that bothers me the most where you can't easily reorganize components through files, which is critical when working on large projects. As for other tools: - Xd is shaping up really nicely, but my tryouts with the components always felt really weird. - Studio is very young and I don't really see it being anything close to competitive in the next 6 to 12 months. - Phase hits all the right notes in the presentation and discussions so I'm really keen on trying it out. - Subform is an excelent choice for some projects especially if you work closely with dev as it is built from the ground up with an api to create adapters to export to any language. You can also use it's engine directly on the web instead o html canvas for example. - Framer is great for microinteractions, and designers working more closely on the frontend, ui & motion. But typically a cog in the chain not a standalone option. Not to forget the dinossaurs: - Photoshop is dead for general Ui/Ux design. Might still be an option for creating some assets but clearly no your main tool. - Illustrator is losing ground, used to be my main for everything digital based, but only open it for vector illustration nowadays. - Affinity Designer is quite good, has some component capabilities but not a key point, I don't see them stepping up here as well, dev team is also probably quite stretched in all their different endeavours. Make sure to understand well your needs and which tool will solve it better. Always keep an open mind and be ready to switch if any tool evolves to solve your problems better. That's always my approach. Thank you...! I think I will take on my free time to migrate a part of our app design on Figma to test it out…! Figma is built on the premise that as a designer, we want to work collaboratively. However, in my personal experience and preference (and, correct me if I am wrong here), I would like to complete the whole thing before involving others in the workflow. Would be great if you can share consolidated feedback with community. Easy to achieve. I design in a private page and then simply copy/paste frames into shared pages, when I’m ready. Yeah, that's what I do but doesn't this makes it similar to Sketch + Invision..? What's the advantage here. Also, I can work in Sketch with native experience without relying on internet connection. You can also design in "draft" and then move the entire file over into a project. I feel you! That was their original messaging which I still feel was a bit flawed because I too reacted in a similar fashion until I actually tried it out. I feel like the "multiplayer" aspect is less important as the "persistent single source of truth" aspect. I use it less as a tool to get together and create something but rather as a persistent status update. If stakeholders are curious about how a project is progressing after they've seen an initial draft they can check in whenever they want. Part of the problem of "complete the whole thing before involving others"is it's anxiety inducing for stakeholders. Yes, I know the common thought is that "stakeholders should trust us to do our job well" but the fact is that it's often not the case. Having the ability to see progress (even if they don't use it) gives them a feeling of control that eases their anxiety and makes happier clients that more quickly trust you to do your job. I'm currently on Sketch which is lightyears better than Photoshop...but I have dabbled in other tools: Figma, Abstract, AdobeXD. Last time I tried Figma, it was really really laggy. But it sounds like the design community is switching to Figma which makes me want to try it again because my team has a big issue with syncing files. We have local versions and then have to be diligent about updating a master version and shared library on Google Drive. Has performance with Figma improved immensely?